We began and ended in the open. 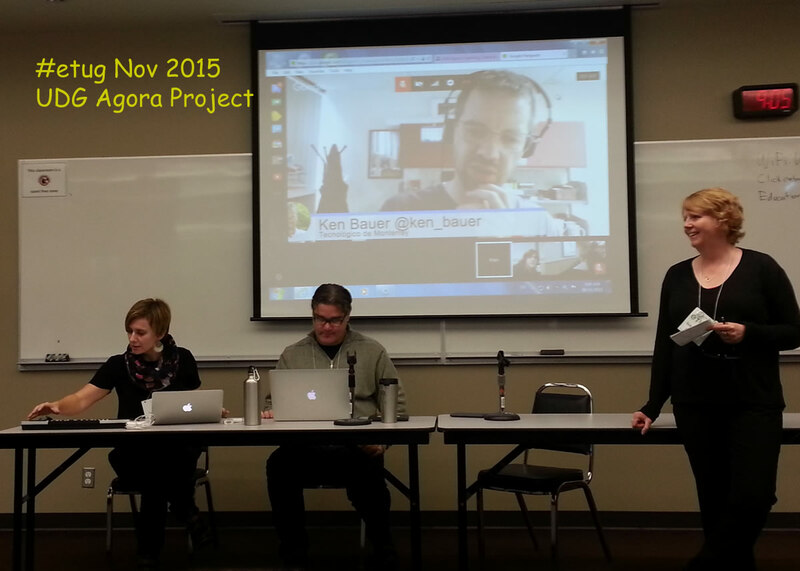 Friday, November 6th was the long-awaited ETUG Fall Unconference! Ken Bauer, "Facilitator of Educational Experiences at Tecnologico de Monterrey". Despite some technical challenges, their hybrid, connected presentation was a glimpse of the possibilities of connecting learners and engaging them in challenging, scaffolded, layered learning online. The Dream Team's challenge was to facilitate / create an open, blended faculty development experience working with the CIEP Docentes (http://ciep.cga.udg.mx) at the University of Guadalajara (UdG). Approximately 300 UdG professors are enrolled in a six month diploma program with a focus on teaching professors how to create student-centred experiences supported by mobile devices (read "iPads"). The participants from the University of Monterrey had a range of technological understanding and motivations and experience with open tools or learning; the "dream team" managed to engage them in Twitter-conversations, studio-learning, exploring regular creative challenges and sharing online, and supported them in revisting their existing courses to redesign and energize their teaching and learning. 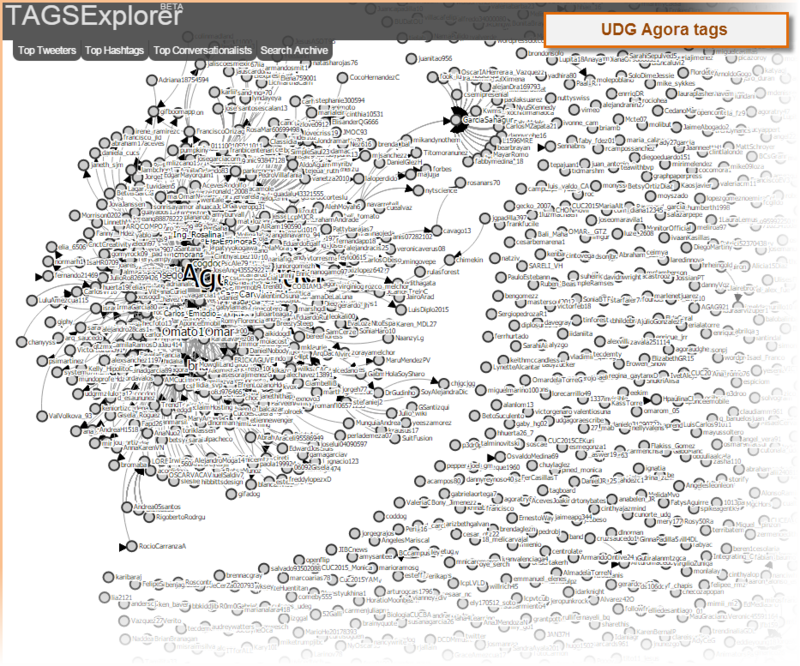 An illustration of the amazing "cloud-conversations" that are occuring in the open Agora (now with contributors around the world) is shown by this TAGSExplorer (built by Martin Hawksey) snapshot. Even more exciting is that the whole challenge-based, layered, open and flexible learning approach is available for anyone to review and use. 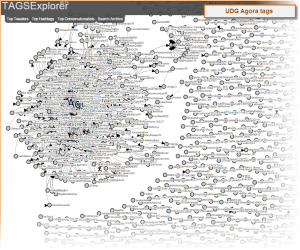 So, dive into the tag cloud or peruse the somewhat inaptly named "Agora Site Map" Find out more about Tannis' "ETUG Taco Challenge" and, don't be shy, build a taco and share. It was great to see familiar faces from last year's ETUG sessions but there were also lots of new faces to get to know. The second plenary presentation was focused on open textbooks, a familiar BCcampus topic. 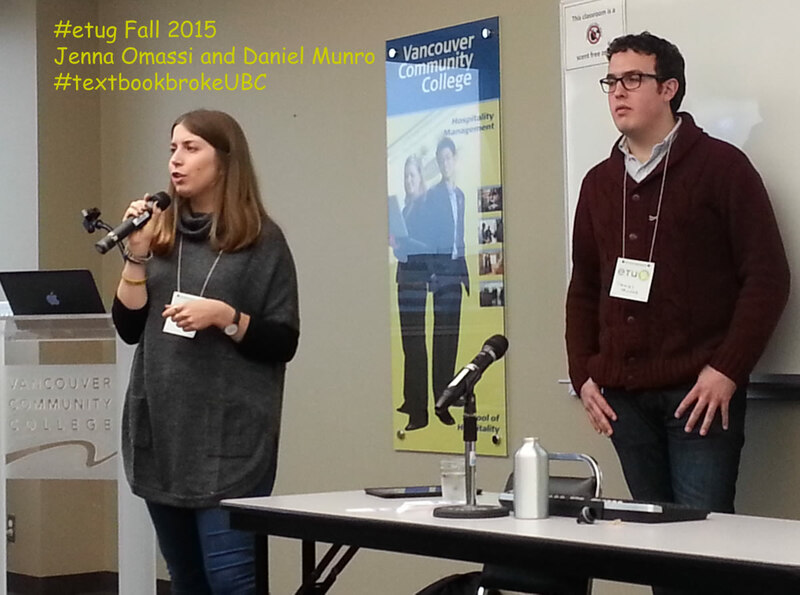 We were given a clear overview of student issues and concerns about open textbooks and resources during a lively and thorough presentation by UBC student leaders, Jenna Omassi and Daniel Munro #textbookbrokeUBC It sounds as though the conversation has involved many students and instructors and the support people at UBC, including the bookstore. Loved the contest where students shared pictures of how much they spend on textbooks, in particular the one that showed expensive textbooks acting as a TV stand! They presented a strong case for pursuing "openness" and more and more instructors are getting involved; not just in open textbooks but in developing a more "open learning" approach (see "Physics Course Adopts an Open Textbook and Saves Students $90,000" – some compelling arguments. I did really enjoy some of the one-to-one or one-to-several discussions that I was involved in during sessions, in the back of rooms, waiting in the hallways, standing in line for food, tea or coffee. Lots of interesting people there – just not presenting for some reason. And I suppose I was the same. I came with two ideas to pitch and put them in my back-pocket (so to speak) because they didn't seem related in any way to any of the topics others were pitching or that were part of the featured focus – so much openness is great but a little overwhelming (I can't believe I just typed that sentence but, surprisingly, it's how I was feeling). Although I didn't find as much to inspire me at this year's ETUG, it was still a really worthwhile event. Kudos to the organizers and the hosts. It was a good reason to explore a part of Vancouver that I haven't seen for a long time. Online learning activities jam – messy learning! Well, it’s been a couple of weeks since I wrapped up my first open online learning seminar with the wonderful SCoPE community. I have always enjoyed the interesting discussions and activities and people you meet during these open seminars and had benefited so much from this community when I lived and worked up north. It was a great chance to share back; I hope someone else steps up soon. If you have any ideas you’d like to explore with a varied audience of educators, contact Sylvia Currie, the community steward! My intent for the Creating Engaging Online Learning Activities JAM was to start from a focus on what motivates people who learn online, and then to move on to planning a single online learning activity and sharing it with an audience of informed and experienced educators who would provide constructive criticism, suggestions, ask questions and generally help us all polish our initial designs. 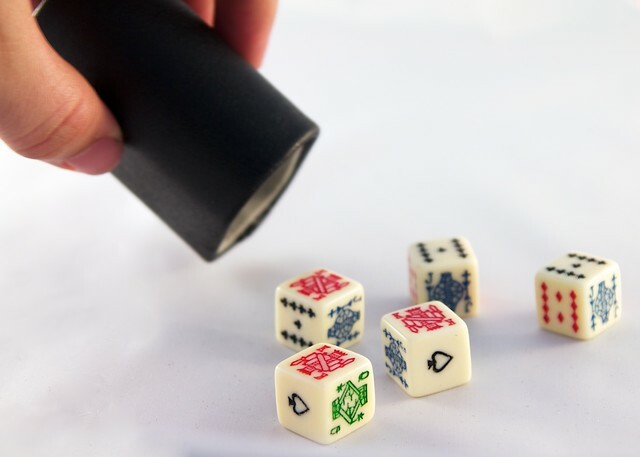 I even had hopes that we’d have time for a few practical participation sessions where people could demonstrate part of an activity to see how it worked with “students” before trying it in a “real” class. So…obviously that was too ambitious for two weeks. Hindsight is always 20:20 and I certainly see ways I could have restructured it, narrowed the scope and perhaps segmented the sessions? I’ve posted a feedback survey and, even if you didn’t participate in the whole seminar, if you have any thoughts to share, please do. While I didn’t get the participation I’d hoped, I had an unanticipated but welcome guest. Professor Curtis Bonk (whose book with Elaine Khoo “Adding Some TEC-VARIETY” I’d used to help us organize our thinking about learning activities from a motivational perspective), stopped by to share some of his adventures since the book was published. He’s had the book translated into Chinese and spent time in the last year visiting Chinese universities to talk about his books. 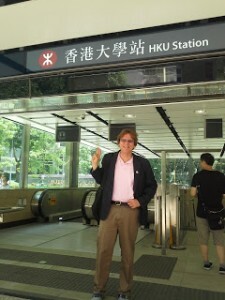 Check out his latest book – MOOCs and Open Education Around the World. For my own online learning activity (OLA), I developed a rough plan to gather 4-5 videos found on the Internet (TED Talks, Google Talks, etc.) that focused on new ideas about teaching online. I wanted to explore ways to use videos to provoke more critical thinking and then use them to “seed” online/face-to-face discussions for a workshop about new approaches to teaching and learning. I had been playing with a new tool H5P that I’d added to my new website (educomm.ca) and decided to use it’s ability to create html5 annotated videos. The value of testing OLAs in a community like SCoPE were quickly evident when I received some really thoughtful questions and suggestions about my initial plan. My final sample video was reviewed in detail by a very knowledgeable participant who pointed out a potential copyright issue I hadn’t recognized, and tested the playback in different browsers and using an iPhone. She also provided some “best practices” around using videos including some accessibility issues I had thought of but hadn’t addressed. I’m in the process of creating a map to the questions I embedded in the video and I plan to provide a link to the interactive transcript (a bonus of using a TED Talk!). I’ll have to choose carefully for the next 4 videos as I would like to ensure that the resulting OLA is accessible as well as engaging. We’ve posted all the resources – from a great collections of links to digital Bloom’s Taxonomy ideas to some open digital bulletin boards with questions to ask yoiurself when planning an OLA. And I’ll share the revised interactive video(s) as I develop them, on this site. 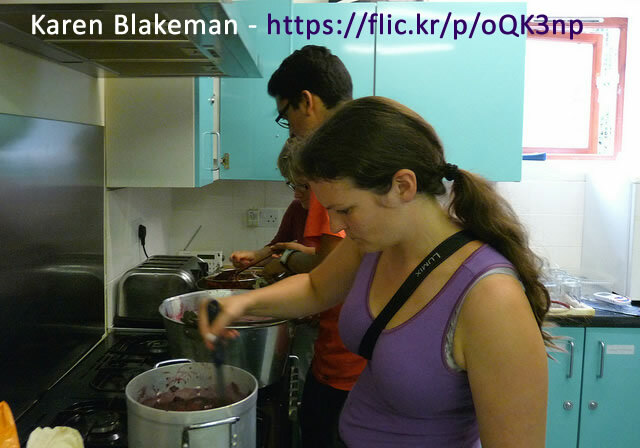 0 0 Sylvia Riessner Sylvia Riessner2015-09-11 15:38:442017-07-02 10:58:29Online learning activities jam - messy learning! Six weeks has just flown by and I received the final notice from the UNSW MOOC – Learning to Teach Online on Sunday, August 16th ! Although I wasn’t able to be as involved as I had hoped, I gathered some great ideas, contributed some good resources back, and participated (lightly) in the online forums. the friendly, open supportive instructor presence established by Simon McIntyre and Dr. Negin Mirriahi! I enjoyed the flexible design of this MOOC and, although I didn’t take advantage of the opportunity to complete activities and participate in the peer-feedback cycle, I found the process interesting to observe. I would think that the resulting feedback would have been very helpful but can’t be sure. I’ve been reading more about the efforts at improving the quality of peer assessments or self-evaluation in MOOCs and in the UK (Re-engineering Assessment Practices in Higher Education). I’d be curious to hear how the participants in the process felt about any improvement in their ability to assess and share? Or, to look at it another way, maybe thinking about motivation, asking questions to guide planning, selecting a type of learning activity (and potential tools) and developing a plan and a prototype is too much to deal with 4 two weeks? 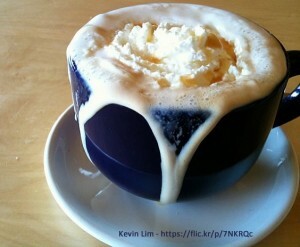 Some might have found that they felt like their "cup was overflowing"? I've thought about different ways I could have approached the seminar and wondered if it would have been better to do two separate seminars; the first seminar to introduce and discuss ideas around engaging students in online learning and exploring different types of learning activities (examples). Then, the follow-up seminar could have been a real JAM and we'd have started off with ideas about selecting tools (for delivery or student response) and focused on sharing our own draft ideas for feedback. I've added a brief survey in the open seminar to collect ideas about ways to improve the experience another time. 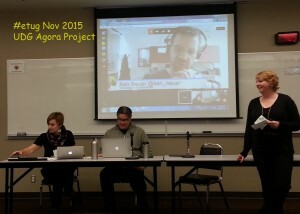 So….today is the final day of the open, online SCoPE seminar "Creating Engaging Online Learning Activities JAM". You're still welcome to post a draft plan or prototype and get feedback. And the resources and conversation will always (as long as SCoPE continues) be available to revisit and reuse. Leonne B. explained how she blends her journaling activity (which includes a success-building rubric the students complete each week) and some computer-skills, applied in their BlackBoard LMS, to develop self-motivated, self-reflective learners with skills to help them in future learning. Viviana C. explained her yet-to-be-tested learning activity that utilizes a focused conversation model to help students explore different science-related quotations from an evidence-based, critical perspective. Her activity provides flexibility and autonomy (two motivational elements) in how students can respond and share their reflections privately with the instructor. The activity is creative and relevant to engage learners. I presented my still evolving learning activity as part of a blended workshop approach to encourage instructors (higher education) to explore different approaches to online learning from a critical perspective. The online component of the blended delivery would be 4 or 5 interactive videos (created in H5P's interactive video tool) that would feature "new" approaches to online learning including at least one that focuses on MOOCs and online learning design. Note: The three draft online learning activities can be found in the First Steps: Planning Your OLA forum thread. Various questions and suggestions helped the presenters think about making minor changes or finding ways to encourage further student-to-student interactions. It will be interesting to hear about the future delivery of these engaging OLAs. We briefly discussed finding ways to use the SCoPE online learning community and platform to connect researchers or instructional designers wanting to test new teaching/learning activities with teachers who want to try new approaches but who don't have the time to fully develop them or support them during a busy teaching semester. We talked about the upcoming research by Leonne Beebe (University of the Fraser Value) and Sylvia Currie (BCcampus/SCoPE) into the Facilitating Learning Online workshop's self-assessment of participation rubric. We found out about the November 13 BCCampus-sponsored symposium Scholarly Inquiry into Teaching & Learning Practice – registration opens August 31st – they're accepting proposals until September 20th. And a final contribution from SueH – a new MOOC platform launched in Europe – EMMA (European Multiple MOOC Aggregator) – something to check out and blog about in the future! 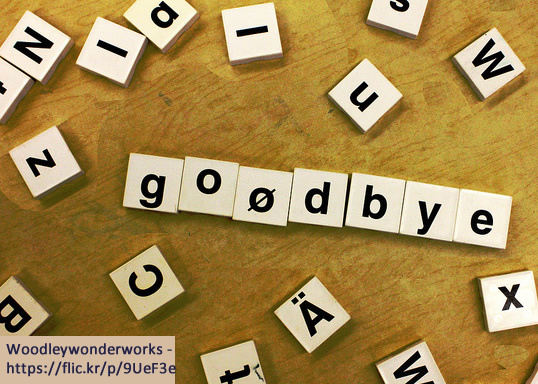 It's been a great two weeks – what an immersive learning experience for me. I'd recommend it to anyone who wants to explore an idea or teaching practice. Just contact Sylvia Currie who hosts the SCoPE professional learning community. We're off to a great start (despite inadvertently starting on a B.C. holiday weekend with perfect weather) with a growing group of educators with diverse (and extensive) backgrounds and a shared interest in developing more engaging online learning activities. Thanks to SylviaC for encouraging me (gently nagging me 😉 to dive in and commit to facilitating my first open online SCoPE seminar "Creating Engaging Online Learning Activities JAM". We began August 1st and we'll continue until August 15th. And I'm ridiculously optimistic that people will be willing to plan a future return to SCoPE to share their experiences and learnings when they actually use their draft OLA. 2. As a learner, exploring a new approach to developing an online learning activity. My facilitator voice will be in the default font here (who knows what it really is – it looks to be a sans serif so I'm guessing Arial). I may try to find a cute hat icon but can't promise. My learner voice will be in Comic Sans (which may not be a designer's choice but it might be appropriate). As a facilitator, I'm trying to remember to practice what I preach – don't overcomplicate things – don't dump everything you've collected or thought about the subject on participants all at once – find ways to help them organize the information but leave lots of room for alternative approaches – encourage them to share and feel comfortable doing so – help them by "pre-digesting" the lengthier articles or videos so they can quickly identify what may be most relevant and useful. There's more but you get my drift. So far I tried to start out with a focus (and discussion) about what motivates people in general and learners (online mostly) in particular. Some great questions so far; we have some very thoughtful and experienced educators in the group. If you're interested in developing an online learning activity in a community of supportive peers (and for FREE!) in a little less than two weeks, join us in SCoPE. You'll only need to sign up if you want to participate (and I hope you will).